Bills overwhelming you? Family members always told me that bills are a necessary part of life when I was growing up. Still, I know that doesn’t mean it’s okay to feel broke all the time due to bills. If your bills are too high and it’s causing a financial strain, you don’t have to settle for your situation as is. 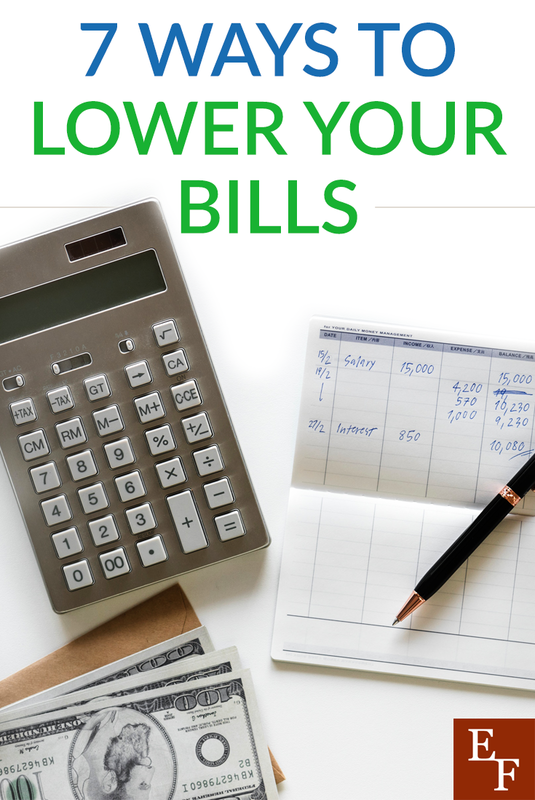 There are many ways to lower your bills and create more room in your budget. Here are my favorite 7 ways to lower your bills. Your grocery bill is likely one of the biggest monthly bills you have. Many people struggle with controlling their grocery bill because they need or want to buy certain foods. It’s so easy to shop impulsively and if go over budget especially if you’re using a credit card. One thing I like to do when I’m trying to be mindful of my budget is carry only cash to make my purchase and shop with a list. If you tend to dine out a lot for work lunches, you can also start buying items for lunches you can create at home and bring to work instead. We started doing this several years ago and it didn’t increase our grocery bill by much at all. Finally, you can use cash back apps like Ebates to earn rebates on the groceries you purchase. Ebates is simple to use. Find out how to use it here. If you’re not locked into a contract with your wireless service provider, you’ll want to make sure you’re paying the best price for your plan. Personally, I’ve always gone with prepaid plans because they were cheaper than contract plans. Nowadays, popular cell service companies have developed their own affordable prepaid plans or added generous contract terms to their plans to compete. It all comes down to what cell phone features you’re looking for and how much you’re looking to spend. I’ve been using Straight Talk for several years. They have plans as low as $35/month for talk, text, and data. I know that if I ever need to lower my phone bill, I can downgrade my service easily and pocket more cash. One of the easiest things I do to lower my heating and cooling bills is to delay turning on the AC of heat for as long as I can. I usually don’t turn on my heat until November each year and during the summer, I use fans in the house and find ways to keep cool before blasting the AC. If you have a programmable thermostat, make sure you’re getting good use out of it when you do need to use your AC or heat. A programmable thermostat automatically adjusts the temperature in your home throughout the day depending on what your schedule is like. For example, you can set your thermostat to change around the time you go to bed or when you get ready to leave for work each day so it’s not running in an empty home. Using a programmable thermostat can easily save you at least $15/month on your heating and cooling bills. If you’re still having trouble paying for your electric bill and have a lower income, you might want to see if you can qualify for energy assistance programs. There are government and community organizations with programs to help you pay your utility bills by providing you with a percentage of the payment. Most programs will have income limits you’d need to meet among other qualifications in order to take advantage of the program. Still, if you’re struggling, this along with similar relief solutions funded by charities and organizations is something you should consider if you’re truly struggling until you get back on your feet. One of the easiest ways to lower your insurance premium is to raise your deductible. Now, this does put you at a greater risk since you’d have to pay a higher deductible before insurance benefits would kick in should you ever need them. However, if the deductible is manageable and you hardly ever use the insurance, you may find it more beneficial to have a lower monthly premium. Another alternative would be to shop around and compare insurance products. If you can find a competitor with a cheaper policy with the same coverage, you can make the switch and enjoy instant savings. I do this all the time with my car insurance since my rates would always sneak up each year and I wondered why. Then, I realized that each insurance company is trying to beat the other one out in providing the best coverage for the lowest price. So, I took some carriers up on their offer and saved some serious money. You can lower several of your bills if you decide to get a roommate to split your living costs with. I know this isn’t an option for everyone, but if you have an extra room or space in your home that isn’t being used you can rent it out to someone. This is what my husband and I are thinking of doing with our spare bedroom. The roommate can either pay a flat fee to rent your space or you can also have them cover a portion of the utility bills in the house that you share. This is wise especially if they will be living with you long-term. Tip: One way to lower your bills when it comes to rent is to list your extra room on Airbnb. While some bills are necessary, I can’t say the same about the other ones. If you’re feeling overwhelmed by all your bills be sure to run an audit and make sure you’re not paying for any unnecessary ones. Subscriptions are the first thing you’d want to cut if you’re struggling to pay mandatory bills like your utility or medical bills. You can easily get rid of subscriptions with the help of a free service called Trim. It will help you identify subscriptions you may have forgotten about. Sometimes, we blur the lines between wants and needs and obligate ourselves to stress out overpaying for expenses that we could do without. Even if you just make a temporary cut, you’ll feel relieved once your budget starts to have more breathing room. How do you lower your bills?